This entry was posted in News and tagged #nextbikeadventure, ALS Bike Trek, Bike MS, Bike Rally, BMX, may bike events, mountain bike, Mountain Biking, races, recreational riding, Spring flower bike ride, Spring Riding, Trail rides on April 25, 2017 by Russ Lowthian. The wait is over! The snow is gone, replaced by rain showers that brings spring flowers and many bike events. Find your favorite trails and countless opportunities to take a ride here. Below are plenty of bike events to start your riding season out right. Start the spring off in the Twin Cities the right way with a nice bike ride followed by by an all ages after party with beer and live music. You have the option of choosing between the 45-50 mile ride and the 100-mile option. There’s also a party goes from 1:00 pm to 9:00 pm and is free to get in. Registration is the same price for both options and you can purchase an official jersey for $85. A ride portion has been added to this annual event. It follows the same course around Woman Lake in Chippewa National Forest. But unlike the run and walk portions the ride is not timed so it’s a great opportunity to enjoy a Saturday outside. First Saturday in May from 7:30 – 2:00 pm. This event is a mixture of running and biking. The Stillwater event has a short and long course option. The race starts at 8:45 am and is followed by an after party with tacos. 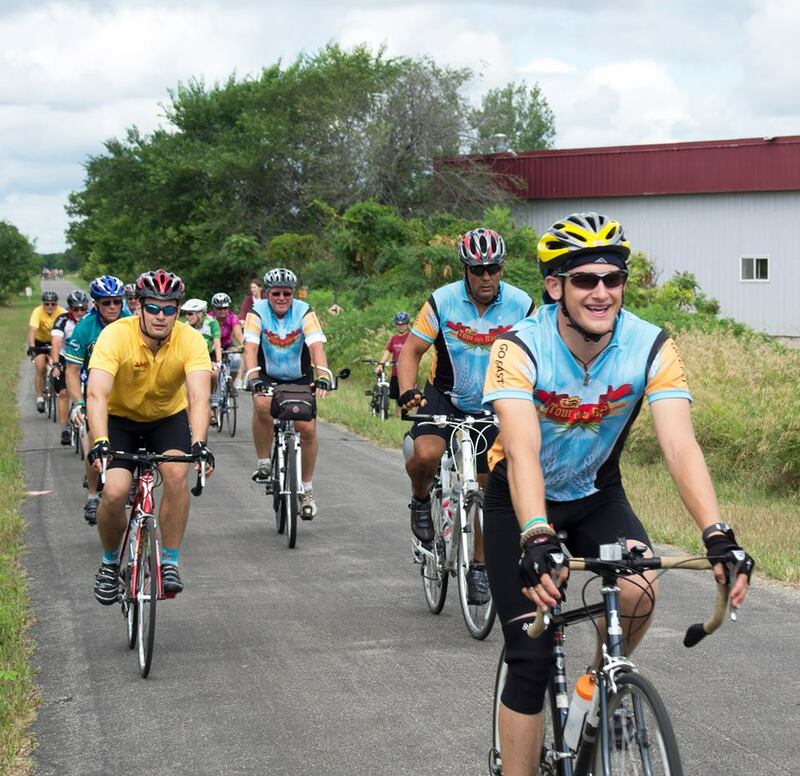 Come ride the beautiful bluffs and valleys around Red Wing and help efforts to eradicate Polio. There are also four biking distances to choose from: 10, 16, 37, or 43 miles. There’s a flexible start from 7:00 am – 8:30 am. This year also features The Family Five Bike Ride available to all ages, and starts at 9:30 am. Help raise awareness and fight for the end of Multiple Sclorsis (MS). You can register as a team or individual. It’s $45 to register and you must raise a minimum of $50. The ride begins and ends at Summit Brewing Company and features a choice of five different urban routes:12, 22, 40, or 50 miles. This event starts at 6:00 am at Burlington High School and offers three different course options: 23 miles, 40 miles, and 62 miles. There’s also an additional 10-mile Family Ride for $30 and up to six family members can enter. All pre-registered riders will receive one ticket to the Chocolate City Festival on Memorial Day weekend. There are three different options to choose from 104-mile, 52-mile, and 23-miles. Each race is catered to different skill levels. There are cash prizes for the 52- and 104-mile rides, and medals for the 23-mile ride. This race takes place on a 15-block course. There are also different start times for its several categories, and takes place entirely on city streets. Register online at USA Cycling. The ride takes place the Sunday before Memorial Day. There are options of 35-, 50-, 100-mile courses. Each one starts and ends at Irvine Park. Registration is from 7:00 am – 10:00 am and the ride follows immediately. The entry fee is $35 for individuals and the Family Ride is $80. More information is available online. This gravel race attracts riders from all over the country. The race starts at 5:00 am. 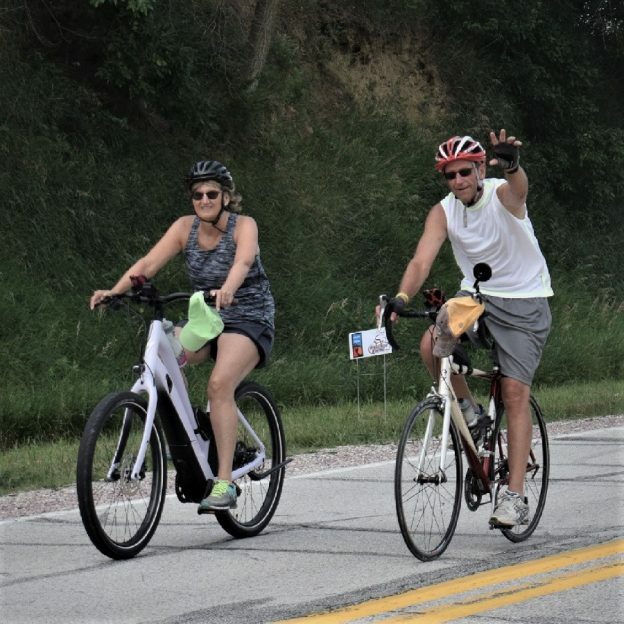 Part of Wilderfest, this ride takes participants through the scenic farmland of Southeastern Minnesota. The race starts at 7:00 am. Part of Wilderfest, this bike race takes riders through the rolling farmland of Southeastern Minnesota. It starts at 9:00 am in downtown Spring Valley. This ride is to support female, transgender, and gender non-conforming riders so priority will be given to them. Entry is also free and there are 10-, 20-, or 30-mile options. Registration is at 8:00 am – 9:00 am at Hope Lutheran Church. The 30-mile starts at 9:00 am, the 20-mile starts at 9:15 am, and the 10-mile starts at 9:30 am. This event that starts in Grand Marais has a 50-mile and 100-mile course. Riders will climb through beautiful scenery which includes a great view of the US/Canadian border. An after party also follows the ride of Voyageur Brewing Company. Entry fee is $70 and registration ends on May 26th. This bike event is part of the Wisconsin Endurance Mountain Bike Series. Spend Saturday afternoon in St. Croix Falls for a free ride on the Woolly Trails and around town. You even have a chance to win cash and prizes. Registration is now open. USA BMX has plenty of indoor and outdoor parks throughout the country. There are numerous opportunities throughout the month to participate in clinics, practice your skills, and even enter in races. Spectators can watch most of the races for free. This bike event starts at 9:00 am and is another great way to start off the season. It starts with a swim at Alexandria Discovery Middle School, and is followed by a 13-mile bike ride with three miles on the Central Lakes Bike Trail. It finishes with a run through a residential area. This multi-sport event takes place at Lake Elmo Park Reserve and attracts athletes from all over. It’s a 3-mile run, 14-mile bike, and 2.5-mile run. The event is limited to 500 participants and registration through May 13 is $60 for individuals and $75 for a team. Same-day registration is $70 and $85, respectively. This is a non-swimming triathlon in Southeast Minnesota’s Root River Valley in Bluff Country. Participants canoe or kayak six and a half miles down river from Houston to Mound Prairie, and then bike back to Houston. The race ends with a three mile run. An awards ceremony follows and you can register online. This event features a canoe/kayak/stand-up paddleboard course on Boulder Lake, a 22-kilometer bike ride on the area’s rustic roads, and a six kilometer run along scenic country roads onto a beautiful forest trail. Register online. This event starts at Orono High School and is mostly off-road. It starts with a 4.5k run, followed by a 20k bike ride, and finished with another 4.5 k run. The race starts at 8:00 am, and you can register online. Kids can enjoy their own race on Friday, May 26th. There are two course options, and each one is designed for specific age groups. Helmet are required. This event attracts athletes from all over the country. It’s a 5k run, 33k bike ride, and 5k run that starts at Sartell Middle School. The race will start in different waves beginning at 8:30 am. All proceeds from this sale go to the Kids ‘n Kinship youth mentoring program. Bike prices range from $25 to $300 with models available for all ages and skill levels. Those who buy a bike will receive a Famous Dave’s Wings coupon, and can also enter in to win one of two $25 gift certificates for Famous Dave’s BBQ Restaurant in Apple Valley. More info is online. Sale goes from 9:00 am to 1:00 pm. Remember, all these events are just a warm-up. There are also plenty of events going on as the riding season shift into full gear. Until then, enjoy your first bike adventures of the season. This entry was posted in News and tagged #nextbikeadventure, ALS Bike Trek, Bike MS, Bike Rally, BMX, may bike events, mountain bike, Mountain Biking, races, recreational riding, Spring flower bike ride, Spring Riding, Trail rides on April 24, 2017 by Andrew Ellis. Bike Pic March 1, time to get ready for TRAM. Time to get the bike ready for TRAM. 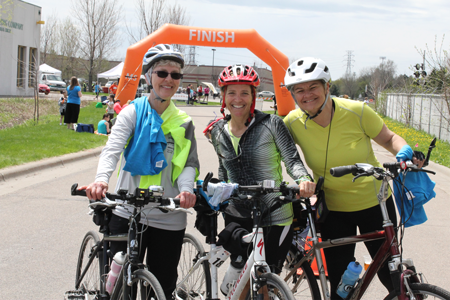 Here Bev Sorenson (right) and her friend pedal Bluff Country in preparation for The Ride Across Minnesota, annually held each summer to help fight Multiple Sclerosis. If you didn’t take your bike in for an annual check and tuneup last Fall, now is the time to take it into your favorite bike shop and save, before they get real busy. Have Fun! 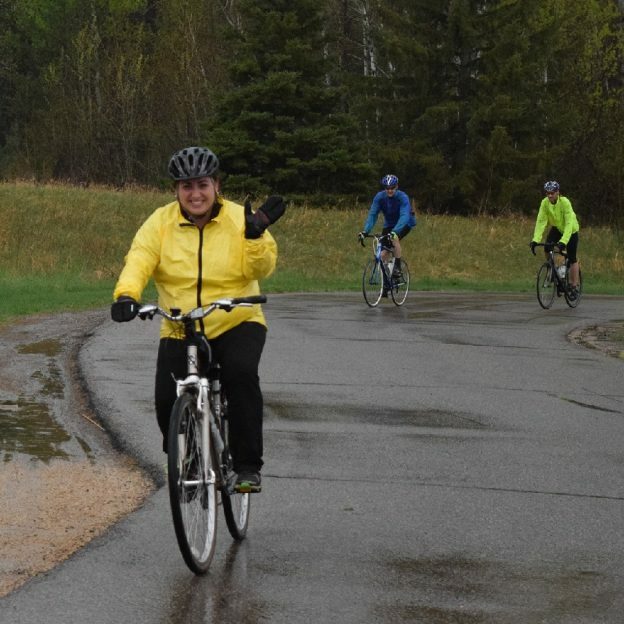 This entry was posted in News and tagged Bike MS, Bluff Country, MN Bike Events, Road Biking Minnesota, The Ride Across Minnesota, TRAM on March 1, 2016 by Russ Lowthian. Nearly 1,000 bicyclists will participate in the 25th annual Bike MS: TRAM Ride, from July 13 to 18, 2014. 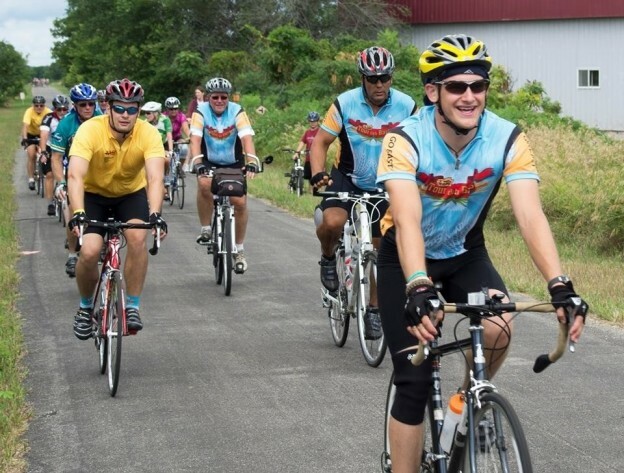 TRAM (The Ride Across Minnesota) is a five-day cycling vacation that covers approximately 280 miles. Every year, TRAM is hosted in a different part of Minnesota, with each host town rolling out the red carpet and providing true Midwest hospitality. This year’s TRAM Ride starts in Pipestone and travels east to Welch Village, Minn. Stops in between include Marshall, Redwood Falls, St. Peter and New Prague. Money raised through TRAM helps the National MS Society continue the important work of supporting people who live with multiple sclerosis. More than 17,000 families living in the upper Midwest area are affected by MS and every push of the pedal makes a difference to each one. 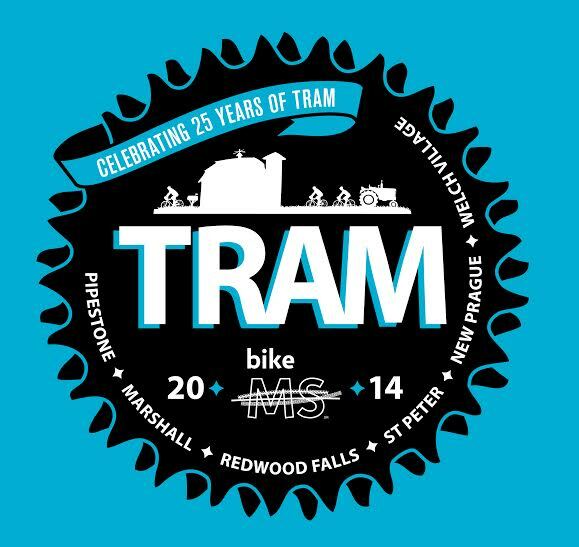 The Bike MS team extends special thanks to all the loyal TRAM riders who return each year to hug old friends, experience beautiful Minnesota routes and, most importantly, strengthen the MS movement. 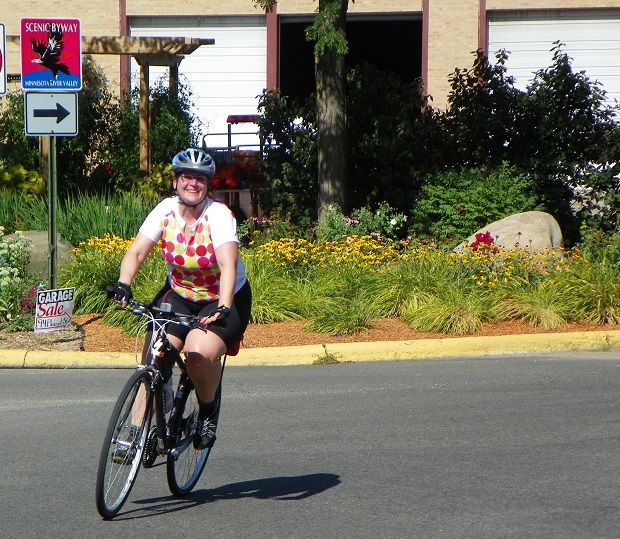 We also welcome new riders with a passion for biking and an appreciation for small-town, Minnesota love. Join us in celebrating 25 years of TRAM! Visit myMSbike.org or call 855-372-1331 for more information and register today! • The first ever TRAM ride started with only a few hundred riders. This year, we’re expecting nearly 1,000 cyclists to hit the road with us. My TRAM — how you’ve grown! This entry was posted in News and tagged Bike MS, cycling, fundraising on June 18, 2014 by Russ Lowthian.